It is Saturday the 6th of August 2011, day 83 of our Cross Canada Trip. 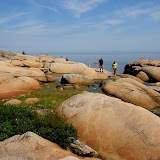 Today our plan was to sight-see along Hwy 138 north, along the St.Lawrence River to Baie Sainte Catherine and Tadoussac to the mouth of the Saguenay River. When we arrived in St. Catherine, the whale watching expeditions were extremely busy, busloads of tourists. Not our thing. A nice young man at the Parks Canada Interpretation Centre advised us to just go on 300 meters, and to stop at the Pointe Noire National Park Site. It is just before the ferry terminal, there we might be able to see some whales. Said and done, we stop at Pointe Noire National Park Site. Not five minutes passed observing the Saguenay River, when we got all exited, there was a pod of Beluga Whales swimming down along the rocks toward the St.Lawrence estuary. Wow they are just beautiful! Usually Belugas are only at home in the cold waters of the Arctic Ocean. But somehow thousands of years ago, probably after the last ice age, these Belugas stayed here, and are happily existing this far south. Amazing! Liz and the Saguenay River in the back drop. We then continued across the Saguenay River on a very efficiently run, nice and free ferry. We were so exited and hoping to see more Belugas, that we did not stop in Tatoussac. The village of Tatoussac was the first fur-trading post in Canada. Driving past Tatoussac, we stopped at Cap-de-Bon-Désir. Here we could venture out onto the rocks polished by the tidal waters of the St.Lawrence River. This is a beautiful spot to look out for marine life. We did not see any more whales, but some Dolphins swam by looking curious at all us people sitting on the rocks. Further north we stop at the Marine Environment Centre, unfortunately the underwater interactive video ( direct video contact to the underwater marine life in the estuary) was fully booked out. Make sure to call ahead and reserve a spot, looks like a lot of fun. On the way back we stopped again at Pointe Noire where we saw the Belugas, it was a beautiful vista over the Saguenay River and the St.Lawrence River, but the Belugas were hiding. The Saguenay River flows through the world's most southerly natural fiord. This fjord was formed about 10,000 years ago by a retreating glacier ( hence the Belugas). The fiord is up to 300 meters deep and its waters look dark inky blue. The Saguenay River flows all the way from Lac Saint-Jean to the St.Lawrence estuary. Happy, and full of new impressions we came back to our campsite at Chutes Fraser in Rivière Malbaie. For more pictures from this part of our cross Canada trip click on the picture below or go directly to the slideshow here.